A 1 day Uganda gorilla tour to Bwindi forest or Mgahinga national park starting from Kigali and driving back to Kigali for dropoff. 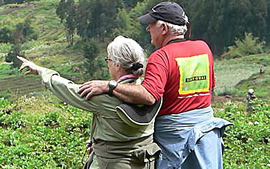 This is a convenient and cost-effective tour for visitors in Rwanda with limited time for tours and on budget. The 1-day gorilla tour in Uganda from Kigali is a perfect alternative for 1-day gorilla tour to the Volcanoes national park, but with an added advantage of spending less on your gorilla permit, with a guarantee of watching mountain gorillas in their natural habitat. Early at 3:00 am, our driver guide will pick you from Kigali and transfer you to Uganda via Cyanika border to kisoro or Katuna border to Kabale. It will take you approximately 4 hours to reach the national park to join the other travelers for a briefing. You may have breakfast during the briefing time. At 8:00 am, you will hike into the tropical forest following specific trails in search of the allocated gorilla family. 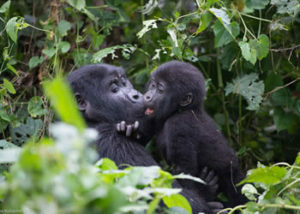 The trekking time range from 30 minutes to several hours but the interaction with gorillas last for an hour. You will then descend and transfer back to Kigali for a return flight.